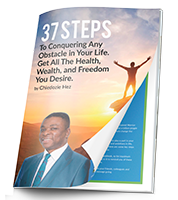 37 steps to conquering any obstacle in your life. Get all the health, wealth, and Freedom you desire. Do you want to revolutionize your organization’s productivity and impact or want to inspire your team to up their game every day? We know that the world is full of competition and with the advent of technology and the stress of modern life; it has become critical for organizations to find ways to stay ahead of the competition for it to succeed. I founded the Unchained Warrior Movement; with the sole aim of inspiring greatness and high performance and a goal of unchaining at least 1 billion warriors worldwide to live to their full potential and change the world! This is based on the fact that we are all gifted and talented in different ways and if these can be put to work, we can all achieve limitless success. Born in a small village in South-East Nigeria called Ezeoke-Nsu, I lost my dad at the age of 9 which totally changed everything for me and my 6 siblings. Determined to live to my full potential, I started the endless journey of personal growth and self-improvement by reading books and making friends with wise and respected men in the community and later on the internet from whom I have learned a lot. I have studied for degrees in Chemical Engineering, Environmental and Water Resources Engineering and Information Systems Engineering and spent close to 20 years in IT which includes leading large award-winning transformation projects and programmes at Fortune 100 companies. I have spoken at many organizations and youth enlightenment events. Drawing on these years of experiences, I cover topics like team motivation, process improvement, organizational and cultural transformation and optimized performance. I understand that every organization is totally different in culture and products, so I let you tell me about your organization and your expected outcomes and I will put together a speech, presentation, seminar or programme that will deliver those outcomes for your organization. If this fits your requirements and you are serious about results, then get in touch at Chiedozie@unchainedwarrior.com. Chiedozie Hez is an Entrepreneur, Performance Coach, International Inspirational Speaker and Blogger. Getting the Best Out of Yourself – Lessons from Gold Mining. © 2018 Unchained Warrior. All Rights Reserved.